Back home from a vacation in Tennessee! 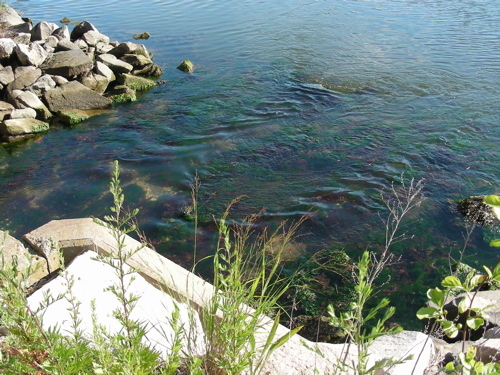 My family has visited the area many times. 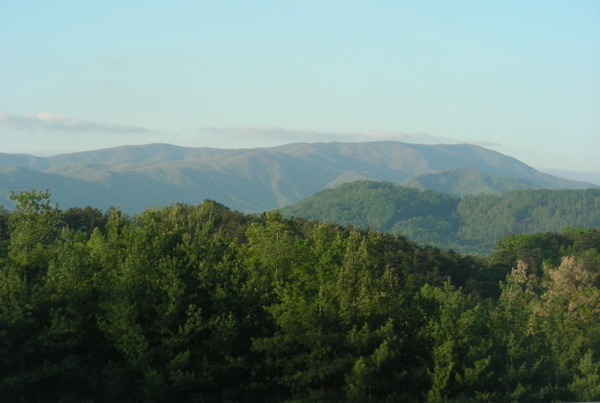 We enjoy the beautiful Smoky Mountains. This was the first time we visited Parrot Mountain and Gardens. What a wonderful place. Hundreds and hundreds of tropical birds. 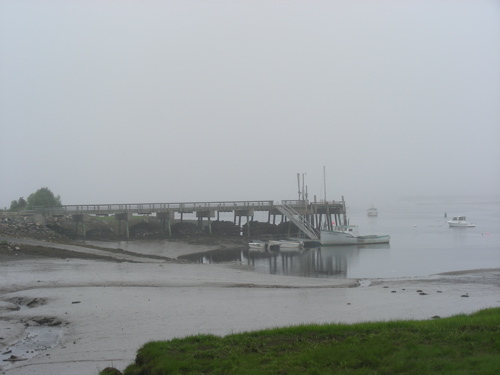 I was so enchanted by the birds, I didn’t fully take in the tropical vegetation and the cottages. 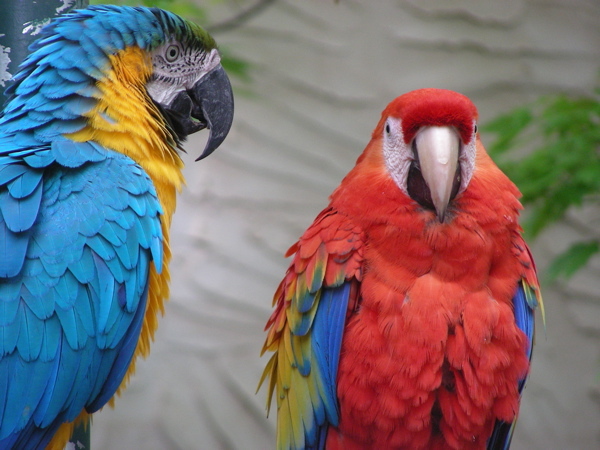 Domestic parrots and cockatoos often outlive their owners. Parrot Mountain takes birds in need of a home or in need of rehabilitation. 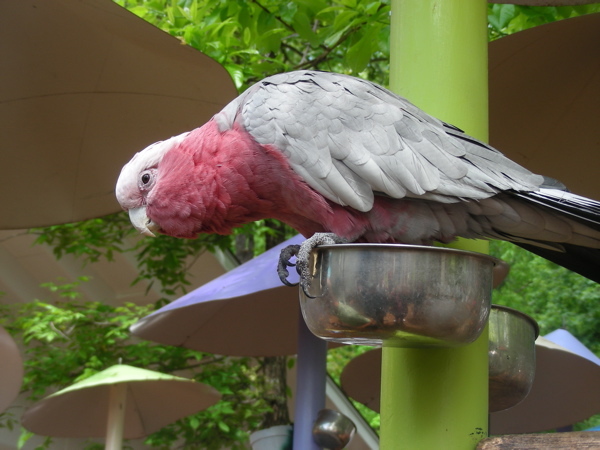 There is a huge variety of birds in the bird garden where birds sit on open perches. Visitors are allowed to feed them and have them perch on shoulders and arms. Because many of these birds come from loving homes, they’ve been taught to say words. What fun to hear ‘I love you’ or ‘whatcha doin’ and turn to find a cockatoo peering at you hoping for a treat. The lorikeet aviary was delightful. Step into the avery with nectar in hand and the lories descend. Birds being birds, we wore long sleeves and took hats to wear. I forgot to put my hat on. Thankfully, my hair didn’t get any ‘special treatments’. The staff members were helpful in every way. They were readily available to answer questions, take photos or rescue unsuspecting visitors from sassy glasses snatchers and ear nibblers. The visit to Parrot Mountain and Gardens was the highlight of our trip. 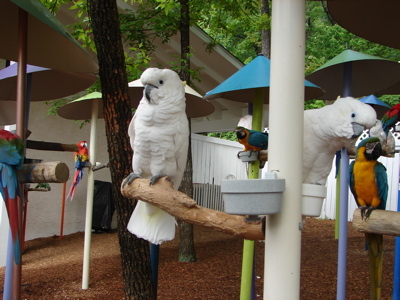 Have you visited Parrot Mountain or any other tropical bird attraction? 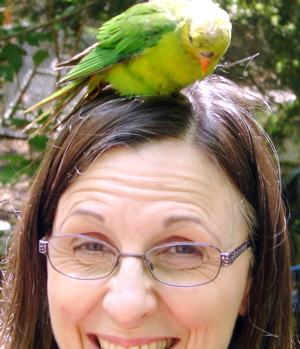 Posted in Anita K Greene, Author, Photographs, Travel, Writer and tagged Bird, Cockatoo, Gardens, Lorikeet, Parrot, Parrot Mountain and Gardens, Tennessee. Bookmark the permalink. These words by Bruce Barton (American author, advertising executive, politician) ring true for me as I look back on the first quarter of 2012. The energy that accompanied the hope of a new year has ebbed under the weight of life. But with the Spring comes a glimmer of what I’ve searched for through this Lenton season just past. A clearer vision. Fresh hope. Still hazy on the horizon, but there. Emerging. Out of hope – progress. 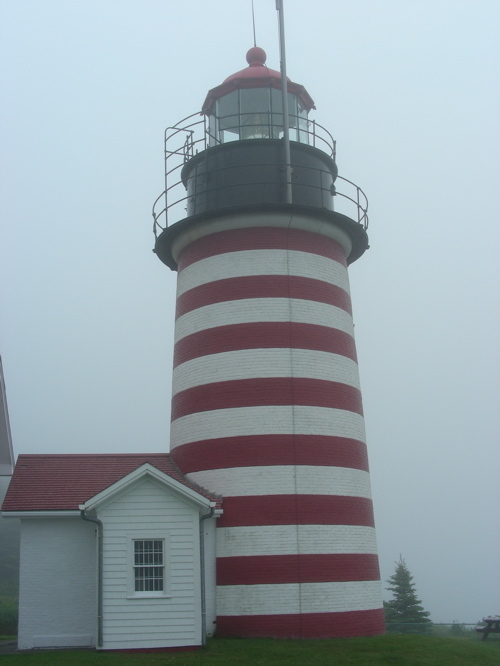 Posted in Anita K Greene, Author, Inspirational, Writer and tagged Bruce Barton, ebb & flow, Psalm 33:22, rhythm of life, rhythm of living, Romans 12:12, turning the tide, West Quoddy Lighthouse. Bookmark the permalink. I needed a quick card this week and turned to the stash of cards given to me over the years. The ones that are special at the moment but not ‘keepers’ … but yes, I have kept them because how can I toss something someone paid hard earned cash for, not to mention the time spent choosing it especially for me? Those cards are beautiful and bright. Using pieces of them in the cards I make extends their life. Do you like the daisies? Those are from the front of a lovely card given to me by my wonderful mom-in-law (who bears no resemblance to the mother-in-law jokes out there.) A bit of embossing, a snippet of dotted ribbon, paper lace punched with the Doily Lace punch by Martha Stewart and ‘Ta-daaa‘. A cheerful card. What secrets do you have for creating a last minute card with a minimum of fuss? 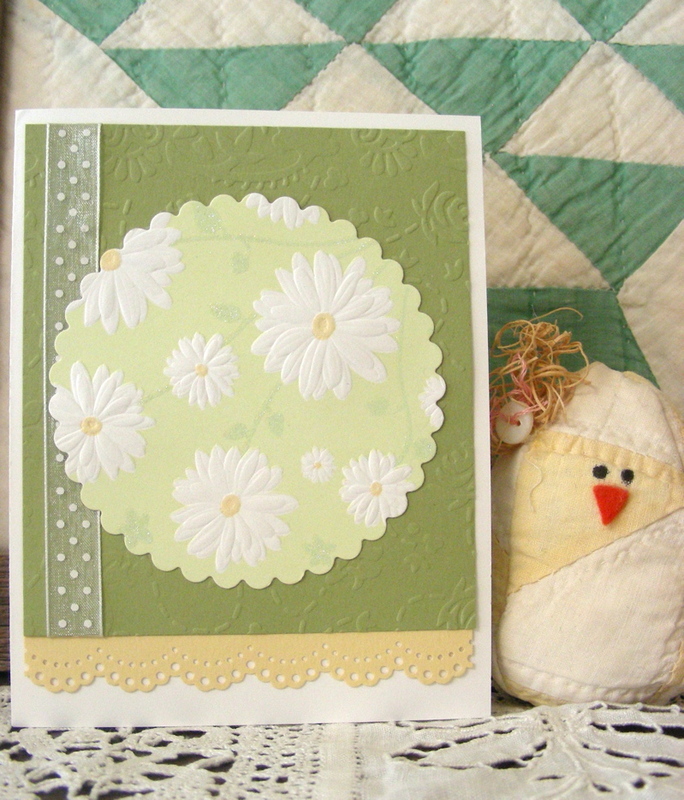 Posted in Anita K Greene, Author, Paper craft, Writer and tagged daisies, daisy, Doily Lace punch, Martha Steward. Bookmark the permalink. A day of joy for Christians. 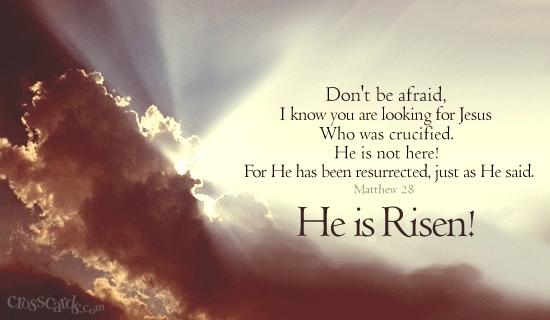 Posted in Anita K Greene, Author, Inspirational and tagged Easter, He is Risen, He Lives, Matthew 28. Bookmark the permalink. Posted in Anita K Greene, Author, Inspirational and tagged Good Friday, Skit Guys. Bookmark the permalink. 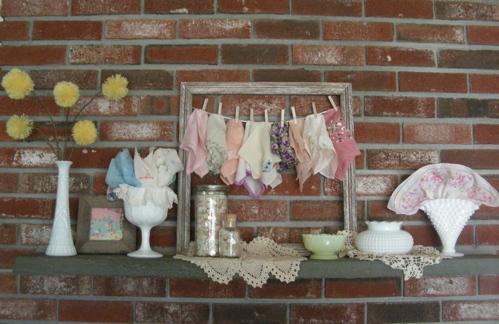 Sorted through my collection of vintage doilies and ladies hankies to create this mantle for the warmer weather. I didn’t want to make the commitment to permanently whitewash the large barn board frame, so I took white chalk and rubbed the frame to lighten it. The fourth hankie from the right – purple floral – is round! The handkerchief in the hob nail fan shaped vase is extra large. 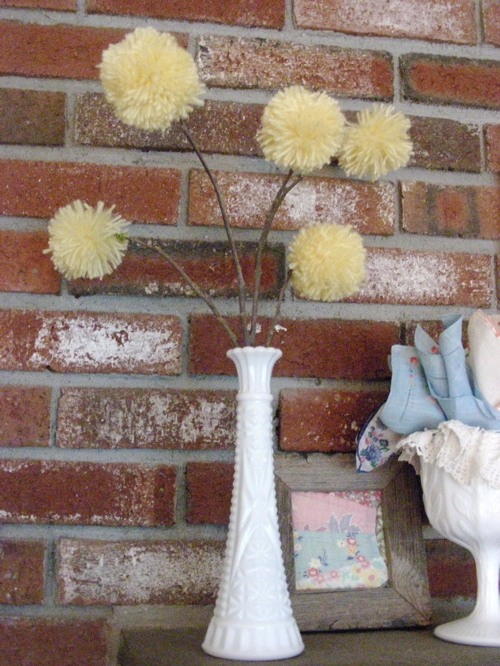 Made these pom-pom flowers after seeing them time and again on Pinterest. Vintage buttons in an old Ball Mason Jar. The tiny pink buttons are mother of pearl that has been dyed. 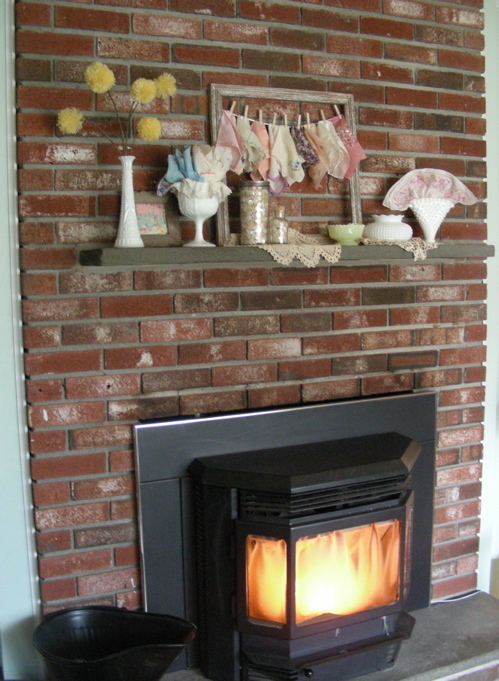 The pellet stove heats the entire house. I have to admit, the mantle has turned into a ‘touchy feely’ attraction. Every time I go by, I rearrange folds or fluff a pom pom. Who knew it would become interactive decor. Posted in Anita K Greene, Author, Home and tagged doily, Milk Glass, pom pom flowers, Vintage buttons, Vintage ladies handkerchiefs. Bookmark the permalink.